Do You Use This QuickTip? : Shoot-N-C Targets | STEVEN HILDRETH, JR.
Posted on April 11, 2015 by Steven Hildreth, Jr. This post was originally published on 26 April 2014 on The Arms Guide. A few weeks back, I was on the range with some friends to help a fellow novelist get familiar with firearms. Another friend of a friend arrived and I found out that he was a federal agent. We got to talking and he mentioned sight picture. 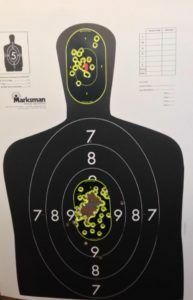 I had always trained to focus on the target, since I had read years ago that the reason most law enforcement missed in armed contact was that they had trained to look at their rear sight post on the range, but when the time came to fire, they were focused on the target. 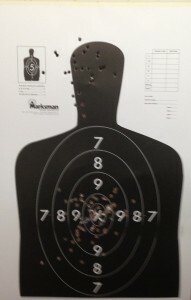 I got decent results with that, but I noticed the federal agent’s shots were right on the money. The difference: he used the front sight post as a point of reference. A couple of weeks after that, I decided to give it a try. The results were abysmal, to say the least. To a beginning shooter, one might go, “Wow, you hit the target so many times!” As a seasoned shooter, I see nine unaccounted bullets, nine opportunities to hit bystanders and catch a manslaughter beef. To me, this kind of shooting is unacceptable, particularly to somebody of my experience. I posted the photo to my Facebook page. As it turns out, many of my readers are also shooters. One particular reader, my friend and fellow author Ross Elder, pointed out that because the target was a blur, I was basically aiming for anywhere on the target. So, when I aimed center mass, that’s why my shots were on the target but all over the place, and why I threw so many head shots (a third, by my count). He suggested I get some tape and make a small box around center mass and the head, and focus on only that. As you can see, my accuracy dramatically improved. Having the Shoot-N-C at center mass and the head not only provided a reference point for aiming, but it also offered me immediate feedback. There were zero misses on the target, only a handful of misses at center mass, and zero misses with my headshots. I would highly recommend Shoot-N-Cs for those who are looking to tighten their shot group. It is definitely a confidence booster. I know I’m not where I want to be, accuracy wise, but I am definitely a lot closer after confining my point of aim with the help of the Shoot-N-Cs than I was without. The plan is to continue using Shoot-N-Cs until I can put all the rounds into the Shoot-N-C at combat speed, at distances up to thirty feet, then I’ll bring my target back to fifteen and replicate it without the Shoot-N-Cs. Crawl-walk-run. Remember, practice makes proficient, and the Shoot-N-C is another tool in the armed citizen’s repertoire to hone proficiency.